Following the culmination of The Eighth Doctor Adventures in 2011, the Doctor had lost far too much to the Daleks, leaving him a morose and broken man desperate to find hope once more. Over the course of three four-story sets that began with a shrouded request to rescue Molly O’Sullivan who had such uniquely dark eyes, the Doctor has traveled through all of time and space amidst shifting timelines as the increasing machinations of the Daleks, the Eminence, the Master, and even the Time Lords in general have continued to battle for prominence. Pushing this incarnation to his limits as the threat of the Time War and his eventual regeneration in ‘The Night of the Doctor’ draw ever nearer, Dark Eyes 4 looks to deliver an impactful finale for this exciting saga that makes the most of the immense setup that has built over two years of storytelling. 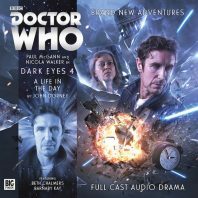 Somewhat strangely, this fourth set starts with a fairly standalone adventure in an epic serial that has been all but devoid of them with John Dorney’s ‘A Life in the Day,’ though doing so does allow Paul McGann to once more exude the happier wonder that defined his incarnation through so many of his adventures prior losing Lucie Miller. Perhaps more shocking, however, is that fact that even Liv Chenka who has been anything but the cheeriest companion given the incredibly tough hand she has been dealt in life is afforded the opportunity to relax and enjoy herself as well. This is a woman who has lived through a Dalek occupation and has undoubtedly proven that she has the mettle and mindset to coexist with the Doctor, but it’s a pleasant surprise that Nicola Walker seems to relish when Liv finds herself the object of another’s affection. Arriving with the Doctor back in World War I London while continuing their search for Molly, Liv is less than thrilled at the prospect of the Doctor selecting a man to chaperone her around town, but she and Martin Donaldson quickly form an understated bond strengthened by the fact that both have seen war and feel guilty enjoying themselves because of those who have lost their lives in the line of service and duty. Martin puts it most succinctly, though, when he asks Liv to stop taking everything so seriously when she can’t even bask in the simple pleasures of a silent movie, and the burgeoning respect Liv develops for this wounded man is grounded with strong chemistry and wholly keeps in line with the Liv that has thus far been presented. However, with androids sent into the past and time grenades threatening to go off and dispersing pieces of the present throughout all of time, the revelations that Martin has been leaving behind particular items to help the Doctor evade capture and that he has been living this day over and over and fallen more in love with Liv after jumping on the time grenade to save the others are all the more impactful, and Liv is sure to feel the impact stemming from the Doctor taking her away from a possible happy future here to search for the TARDIS that so interested those pursuing him. ‘A Life in the Day’ is a poignant affair and truly brings Liv into the spotlight in a wholly new fashion while allowing Nicola Walker to showcase her incredible emotional range. However, at its core it is also quite a straightforward story with the truth behind its menace obvious given its Dark Eyes confines. Still, this surprising reprieve from the dark and tumultuous events breezes by thanks to strong performances and direction, and although its placement to open the final set of stories is a bit odd even as it sets the search for the TARDIS in motion, it retains a certain flare and energy that makes it a distinct and memorable entry in its own right.